I was going to offer some info, but your original question kicked me out of the conversation by not pertaing to me. Good luck. Sorry, didn’t mean it like that. All replies of course welcome and appreciated. I have a Ridgid R4512, 1.5hp I think. Haven’t had any issues except when I tried to rip 4/4 hickory. That stuff is ridiculous. I even resawed 3” Ipe and the saw didn’t struggle like it did with the hickory. The main difference being that the Unisaw will take stuff being thrown it all day long without complaint, while the plastic saw would melt and die under the same circumstance. For occasional hobby type stuff, the blade is more important than the horsepower, and both will cut the same materials just fine. If you intend to rip 8/4 hardwoods or thicker you will be limited to thin kerf blades. Even then you will have to watch the feed rate or you will stall the saw. Sharp blades are a must. I used a contractor saw for 30 years and got by with it, I recently upgraded to 3 HP cabinet saw and don’t miss tripping the breaker on heavy cuts. As another hobbyist, I can tell you that a small saw will do everything a big saw will do, it just may take a little longer. It took me almost 25 years to kill a Ryobi BT3000, cutting everything from pressure treated 4×4s to full depth of blade rips on oak and hickory. I always used thin kerf blades. Just “upgraded” to a delta 36-725. So far it feels like it will do the same work as the old saw. Miss the sliding table from the BT3000, but now I get to build sleds like the rest of you. If you are looking at small saws, pay particular attention to the fence. That’s what sold me on the delta. Not sure if this is helpful to you, but I have a SawStop Jobsite Saw, I use a Standard Full Kerf Blade on it, right now it’s a Forrest Woodworker II, an all purpose blade. Recently I ripped quite allot of 8/4 Walnut on it with no issue at all, very clean cuts with minimal burning. Maybe I could have ripped a bit faster with a more powerful motor, but I’m just a Hobbyist, so It’s fine if it takes me an extra 2 seconds. Are you in a hurry ? Slow the feed rate. I’ve had a 113 for over 15 years, haven’t stalled it yet. My PM1000 cuts everything cleanly with no problems. Love it. I owned 3 saws that were less than 2hp before I went with a 3hp cabinet saw. With the right blade and good setup, all could cut nearly anything I needed to full blade height. However, they didn’t always do it easily, and they were never as nice to use as the saw I have now. It’s alot easier to bog a 1.75hp saw than it is a 3hp saw. My question is if you’re going to make a change from your current saw, why not buy the best saw in your price range, and why wouldn’t you want 3hp vs 1.75hp if it’s an option? The Fusion and PM1000 are not an inexpensive saws, and are not the necessarily the best saws in your price range IMO. Of those two, the PM1000 is the more robust saw with a better fence, but for the same or less money you can land you a new 3hp industrial cabinet saw at your door….you’d gain about 65% more mass, 70% more power, a better fence (pertains to the Fusion), larger hand wheels, and more robust underpinnings. All that should potentially lead to better long term reliability, better accuracy, increased stability, smoother operation, and ultimately increased user satisfaction….possibly even better resale value. There are more variables involved than just horsepower. Sorry, didn t mean it like that. All replies of course welcome and appreciated. 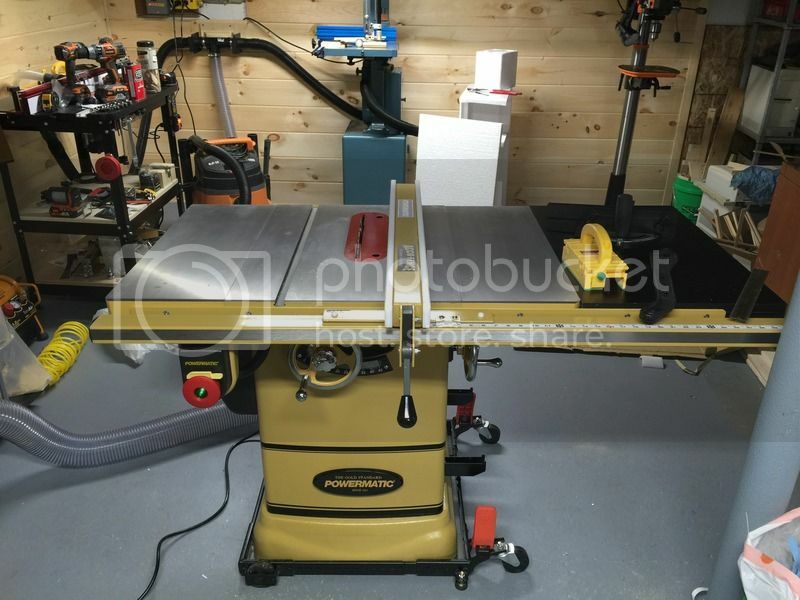 OK you asked about lower power tablesaws. I have the Ridgid portable TS2400. I bought it when they came out new in 99-2000, I don’t know the HP but it is low. If I rip over 5/4 hardwoods or evn 4/4 exotics I have to slow down my feed rate to keep from stressing the saw. There is what your question intended! You kept going with what cuts can’t you do with this saw. That got my first reply to not reply. There is no such thing as a clean cut my saw wont do. The table saw is a frame to hold the motor in place and support the workpiece, The ability of any saw is dependent on accurate set up to prevent binding of the piece, The quality, type, and sharpness of the blade and then knowledge of how to operate the TS with the different pieces. I have no problems ripping 12/4 purpleheart on my 18 yo little portable tablesaw. Neither of us are kids anymore so we just slow down and get-r-dun. Almost forgot about this one. No long ago I bought a new Ryobi 10” TS for a hundred bucks. My health went south for the winter, and forgot it’s way back, several years ago. I can’t do what I used to, but My stash is in the garage along with my milling equipment. I use a 2×4 frame and C saw to rip down most of my wood. It’s mostly Veneer core so it is 12-24” wide and 12-24’ long. Ok then I joint and edge so I can rip it down to close usage sizes. I plane it to thickness I want Cut the lengths down to manageable also. These days most of my woodworking is small jewelry boxes, shadow boxes desktop curios all the way down to jewelry. I can’t stay out in the elements anymore so I built a small shop out of a spare bedroom. The only full size machine in there is my Delta 18-900 drill press. ( I ordered a casket to fit us both) Most of the wood I use is 1/8”,1/4”, 1/2”. On occasion I will use some 1/16” or 3/4”. This little Ryobi saw is only about 22” wide and 17” deep including the rails. I went and looked at it, all it says is 15amp, no HP stated, I would guess maybe 1/2-3/4hp at most, but it does what I need great. The built in riving knife is a pain in the but and will disappear shortly. The new design blade guard is an engineering feat in itself that POS will be gone when I can dig out and old Skill guard I have had since the 80s. The miter gauge seems pretty good but I have to find a piece of rail to fit the table, 1/16” slop sideways. Answer to your question, YES you can have an underpowered tablesaw that is incapable of doing normal things. LOL But I love my little toy tablesaw for what I do. ..... the PM1000 is the more robust saw with a better fence, but for the same or less money you can land you a new 3hp industrial cabinet saw at your door….you d gain about 65% more mass, 70% more power, a better fence (pertains to the Fusion), larger hand wheels, and more robust underpinnings. All that should potentially lead to better long term reliability, better accuracy, increased stability, smoother operation, and ultimately increased user satisfaction….possibly even better resale value. There are more variables involved than just horsepower. Well to compare apples to apples, the 3 hp upgrade to the PM1000 would I guess be the PM 2000, which is about $1,000 more plus a need for 220 V plus the extra weight for moving it etc. So I’m just trying to understand what practical advantages the bigger saw would provide. I realize it is theoretically better in all the respects you mention, but for practical purposes I’m trying to understand how much of a difference will it make to a hobby user? Interesting to hear people’s experiences even if the lack of consensus doesn’t actually make the decision any easier, LOL Thanks for your input. I’ve owned an antique Craftsman with a tilt table, a horse and a half Delta contractor’s saw, A Bosch with a gravity rise frame and two Unisaws. The first a right tilt and the current is a left tilt. A while back, I sold the Bosch, since I don’t plan on going to job sites anymore. Keeping the Unisaw was a no brainer, because I have owned the saws mentioned, as well as having run many more. It’s difficult to say why a hobbyist should opt for a cabinet saw over others, aside from the usual facts regarding dust collection, power, smoothness, longevity, beauty, dependability, capacity (dado, depth of cut), resale value, accuracy, bragging rights, accessory tolerance (e.g., over-arm dust collection, drop down out-feed table, sleds,. . . ), efficiency, . . . . If you have the room and can afford it, why would you buy a Yugo rather than a Honda, Subaru, Toyota or other, higher end item? Said another way, you can get from point A to point B via a bicycle on a nasty day, but, after doing it in a nice car do you want to? Meanwhile, there are many of us hobbyist who would not, willingly, give up our hard to move beasts. There is probably a reason for that. Thin kerf helps, but if you’re ripping long pieces of 8/4 hardwood, go with a 24 tooth or less blade. 95% of the time, I keep my combination blade installed, but when I’m ripping 80” 8/4 for door stiles, I switch to a dedicated rip blade. It cuts like butter on my old Delta contractors saw and less burning too. Well to compare apples to apples, the 3 hp upgrade to the PM1000 would I guess be the PM 2000, which is about $1,000 more plus a need for 220 V plus the extra weight for moving it etc. So I m just trying to understand what practical advantages the bigger saw would provide. I realize it is theoretically better in all the respects you mention, but for practical purposes I m trying to understand how much of a difference will it make to a hobby user? Interesting to hear people s experiences even if the lack of consensus doesn t actually make the decision any easier, LOL Thanks for your input. It’s important to note that the PM2000 and PM1000 are quite different. The PM1000 is a pretty ruggedly built hybrid, while the PM2000 is a pretty ruggedly built industrial cabinet saw….both excellent examples within their classe of saw, but in two very different classes for sure. The differences between a 1.75hp hybrid and 3hp industrial duty cabinet saw are not something that you’ll be able to tell by looking at the end result on a piece of wood. In that regard it can be hard to justify taking the jump to a full industrial cabinet saw. You will notice many subtleties. 70% more power is huge…would you notice adding 70% more HP to the family sedan? Absolutely!! It allows you to dictate the pace of the cut vs having the smaller motor dictate it. The increase in mass is also quite noticeable on the plus side….it’s far more than just added weight when moving it around the shop….it’s stability. The reason for the extra mass – more robust underpinnings, is arguably noticeable in better precision, but also in functioning as expected for a longer period of time….one of the biggest downfalls of lesser saws IMO isn’t in their inability to cut, but their lack of functioning like their supposed to (aka fighting the saw). There’s also the peace of mind that the beefier saw should easily handle everything you’ll throw at it without struggle, and knowing it’s not being overtaxed. The PM1000 is a fine saw…the Fusion is too, but less so, and has some more obvious draw backs with the fence rail design. They are also fairly expensive saws, and even though the PM1000 is a pretty beefy example, both are still considered hybrids in my book. This is one of the areas where the debates come in, and semantics are a part of it, but there are some very solid examples of good hybrid saws for less money than either….Grizzly and Jet both come to mind (in fact, the Jet Proshop is essentially the same design under the hood as the Fusion, but has a beefier welded steel fence vs two-piece aluminum). There’s a part of me that wants to ask “do you want the Cadillac name, or do you want the most performance for your money spent?”, but I know that would spark all kinds of debate that I really don’t want to take the time defend, so consider it “unsaid” ;-). 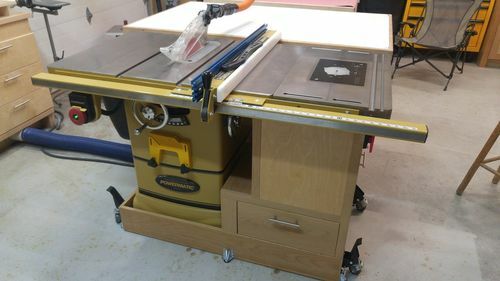 For $1500 and the cost of 220v, you can have a full blown, though less prestigious version of an industrial cabinet saw with a Grizzly G1023RL. If you’re anti-Grizzly, you can get a Jet Xacta 3hp cabinet saw for not much more than a PM1000. I’m not anti-PM at all, they’re just often a hard sell to me at the price point when I look at what the competition offers in the same price range. Saw Stop offers a hell of a saw in the PCS 3hp with T-Glide fence in the $3300 range. Maybe not quite as robust as a PM2000, but still really robust, really accurate, really beautiful saw with a huge advantage of not taking your digits from you. In the price range of a PM1000, I see a full step up in class in the G1023RL or G0690, or Jet Xacta…more robust, more powerful, heavier duty, maybe not quite as nice in the fit and finish category, but a step in class nonetheless (it is a tool after all). I don’t want to make others feel that they need to justify their purchases, and don’t want to bias you to buy what I would….just trying to describe the perspective of someone who’s spent a fair amount of time using several types of saws, and studying what makes them tick. Thin kerf helps, but if you re ripping long pieces of 8/4 hardwood, go with a 24 tooth or less blade. 95% of the time, I keep my combination blade installed, but when I m ripping 80” 8/4 for door stiles, I switch to a dedicated rip blade. It cuts like butter on my old Delta contractors saw and less burning too. I also have the Delta 36-725 and I only run full kerf blades on it, since that what the riving knife calls for. I agree with Rich Taylor about having a dedicated rip blade. In fact, I don’t use my combo blade all that much, really. I’ll use it to break down construction grade lumber and for other rough work, but for most projects, I switch between my rip and CC blades. I haven’t yet run into a whole lot saw can’t handle but then, I’m sure I don’t ask as much of my saw as many here. I haven’t ripped any 12/4 stock but I have resawn boards wider than the max blade height but I made those cuts in modest increments. When I’m able to upgrade, I do want a saw in the 3-HP class because I want it to be capable of accommodating my growth as a woodworker. I’m running a 1.5 HP motor (7.5 amp at 240v). No real issues at up to 8/4 stock. Where I do sense an issue is in using an 8” dado stack—she feels like she’s at her limit. I’d expect that to improve when (not if) I make the move to a 3 HP saw. Not as bad with a 6” stack, but I prefer the cut I get with the 8”. Oddly enough—I recently did a project in southern yellow pine where I ripped a LOT of 10’ long 2×12’s to get 5” wide boards. Had to stop to clean pitch off my rip blade after 2 rips or i’d stall the motor. While doing it, it made me wonder if a 3 HP might have been able to overcome the extra drag, and for sure would have increased my feed rate. I swear the SYP was harder to cut than hickory or Ipe!! If I ever do another “farmhouse” table and benches—it will be with oak!! Oddly enough—I recently did a project in southern yellow pine where I ripped a LOT of 10 long 2×12 s to get 5” wide boards. Had to stop to clean pitch off my rip blade after 2 rips or i d stall the motor. That’s something I’ve been taking more seriously in recent years. I mentioned burning up above, I work with cherry and alder a lot, and I had just resigned myself to that wood burning — like solid shiny black. It doesn’t happen with a clean blade. It’s unbelievable how much better a clean blade cuts. It doesn’t even have to look bad to cause problems, so rather than wait for problems to occur, I clean regularly now. 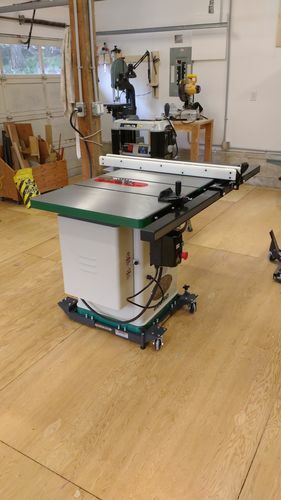 My shop has both a 3 hp PM2000 and a much smaller, older Rockwell/Delta table saw with (I think) a 1 hp motor. In my view, the “clean cuts” I get with my PM are due to the much larger table and better fence system. the difference is more pronounced on larger, harder to handle materials like full sheets of ply or long heavy hardwoods. Motor power will impact your feed rate. Does my PM produce cleaner cuts? Yes, because it’s much easier to feed stock through it accurately. I still use both saws regularly, but I reserve my older smaller saw for smaller jobs. If you buy the smaller motor saw, will you spend more money on the fence & a larger set of blades to work with? What other tools would you be able to afford if you can live with cutting thicker stock a little slower? If it were me, I’d be happier with a lower powered saw that had some awesome blades and the most accurate, solid, reliable fence I could buy. Alternatively, a lower powered saw with 5 AMAZING router bits would also make my day. But you might say, “There isn’t anything else I’d do with the money than buy the saw of my dreams” and in that case, go on & get that bigger motor. I find money to feel kind of abstract, but when I think of what else I could get for that money it starts feeling more real. So … what else would you spend it on? I’ve been using the Dewalt DW746 for 15 years and have never had a problem cutting any type wood. Your shop is one that many of us would be envious of señor Tung, not to mention the beautiful work you create there. 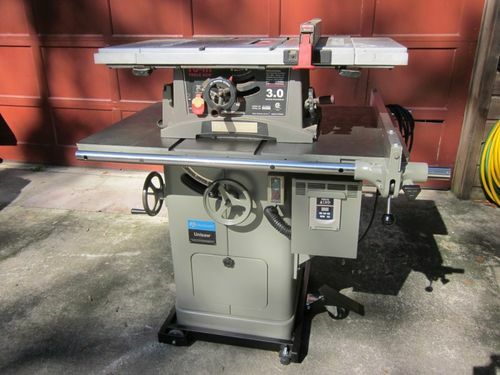 For $1500 and the cost of 220v, you can have a full blown, though less prestigious version of an industrial cabinet saw with a Grizzly G1023RL. If you re anti-Grizzly, you can get a Jet Xacta 3hp cabinet saw for not much more than a PM1000. Unfortunately, Jet doesn’t sell machines or parts into Canada (I think because of a court injunction related to their brand name and a competing company), otherwise they would definitely have been high on the list. I actually visited Grizzly’s showroom in Bellingham recently and it was pretty impressive, but I’ve just been concerned about reports of people having quality problems with their saws; seems a bit hit and miss. I’d hate to get some 600 lb monster in my garage which I couldn’t make run properly, but that may be more paranoia than logic. So thats sort of how I got to the Lugana and the PMs, though I have to think about Grizzly some more. I guess its the usual trade-off of whether to pay extra dollars for the confidence of a particular brand. I do appreciate everyone’s comments though, lots of food for thought. I have two under-powered saws (1.5HP I think) and they work fine for me. I do most ripping on the bandsaw anyway. Since my saws are older and don’t have riving knives, I actually prefer the small motors because if the blade gets pinched during a cut, I can stop the saw without getting a kickback. Unfortunately, Jet doesn t sell machines or parts into Canada (I think because of a court injunction related to their brand name and a competing company), otherwise they would definitely have been high on the list. I actually visited Grizzly s showroom in Bellingham recently and it was pretty impressive, but I ve just been concerned about reports of people having quality problems with their saws; seems a bit hit and miss. I d hate to get some 600 lb monster in my garage which I couldn t make run properly, but that may be more paranoia than logic. So thats sort of how I got to the Lugana and the PMs, though I have to think about Grizzly some more. I guess its the usual trade-off of whether to pay extra dollars for the confidence of a particular brand. I do appreciate everyone s comments though, lots of food for thought. The G0690 and G1023R series are both very well proven, with excellent track records. They sell a ton of those saws (actually they sell a ton of tools in general, so keep the ratios in mind), yet I think you’ll be hard pressed to come up with many significant complaints about a real issue with either of those saws. Many members on this board own them. 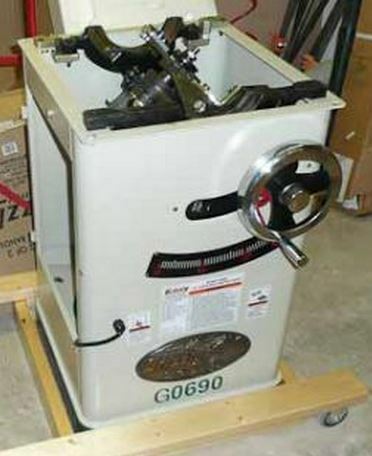 At one time, the G0690 and Laguna Platinum saws were about identical except for color and logos. At one time the G0715P had a significant rash of reports of alignment issues that were similar to those on the Ridgid R4512 and Cman 21833, but did not effect the two larger saws mentioned at all. Supposedly fixed anyway. Several members here also own that saw. A while back there were a few reports of trucking damage from Grizzly, but haven’t read many of those lately, and it’s not directly their fault. That’s part of downside of being your own middleman, but the savings are substantial….same thing can and does happen to anything that gets shipped. The G0715P is a hybrid saw with lighter duty table mounted trunnions, and a 2hp motor. Lighter weight, lighter duty underpinnings, less power, smaller hand wheels, less industrial….still a capable saw if setup well and equipped with a good blade. The G1023RL and G0690 are both industrial cabinet saws with massive heavy duty cabinet mounted trunnions and 3hp motors, stouter fence, more mass, etc…..both are a significant step up in class, both require 220v. Compare the hybrid assembly below to the pics of the cabinet saws shown above. Wow, the difference in the pictures is quite striking. Which would you recommend between the 0690 and 1023RL? They look broadly similar on the Grizzly website, not sure what the important differences are. That’s a FAQ, and a tough question, because there are pros and cons with each, but both are great saws at a great price. Opinions seem to be pretty evenly split…basically it’s subjective. I like the G1023RL for the vertical lift mechanism with the dovetail ways, and the Shop Fox Classic fence. The G0690 has more rip capacity, but you can actually move either fence farther to the right pretty easily to extend the capacity of both to 36” or 40” respectively. I had a 1.75hp TS; was fine for thin stock but really struggled with anything over 1.5”. I use a lot of 8/4 wood so it was an ongoing issue with it stalling and/or me having to use very slow feed rates even with a thin kerf blade. Eventually upgraded to 3hp and it is a huge difference, no more stalling and I can feed the stock as fast as I can push it. Thanks for that Rich. Interestingly, the bed you are probably referring to was built with just that small Rockwell TS. and I will say that splitting 16/4 cherry for the crest rails with that saw was a real challenge that took 2 of us and a lot of patience. I am just a hobbyist and the PM1000 is more than enough saw for me. I have yet to find anything the saw can’t do from cutting 8/4 maple to a 3/4×3/4 dado. I can cut as fast as I want to go. If I had a bigger shop and did a lot more tablesaw work then I would consider a 3hp or larger saw. I was always told, be slow steady and safe rather than fast, stupid and visiting the ER. I am just a hobbyist and the PM1000 is more than enough saw for me. I have yet to find anything the saw can t do from cutting 8/4 maple to a 3/4×3/4 dado. I can cut as fast as I want to go. I had a Craftsman contractor saw for almost 30 years. It was a great saw and served me well. When it came time to upgrade I looked all over. From Powermatic, to Jet, to Saw Stop and finally to Grizzly. I got the 5 horsepower G1023RLWX. I really like the saw. The 5 horsepower motor has never even come close to stalling or bogging down. I cut a lot of pressure treated wood and use my dado stack often to cut lap joints in wet pressure treated 2×4’s. ( I make gates for decks ) I really like the saw. Out of the box it was true as it could be. I have 3 dial indicators and checked the run out on the arbor, blade square to table and miter slots with all three dials and it was with in .001 on all three. I love the fence, the router table wing that came wit the saw, and the ease of set up and accuracy. Only problem I have with Grizzly is their shipping process. When your order ships I found that you have to call them and the carrier twice everyday till you see them driving up your street. All in all I am happy with my new saw. Good luck to you on your upcoming purchase. By the way, we have a new Saw Stop at our school and it was down several weeks till they could figure out what went wrong with it. We had to trouble shoot and repair the thing ourselves. 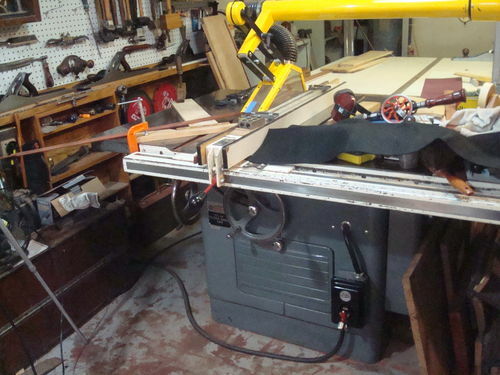 @knotscott By the way, I just read your blog post overview of the tablesaw market. I do a lot of research on the internet on lots of different things, and that has to be one of the best articles I’ve ever read on anything. I have a 1 3/4 hp motor on my saw and it meets my needs well. A bigger motor would be fine also. The only advantage of this smaller powered saw is that if the wood pinches the blade or locks up the blade in any way , with this motor I can easily overpower it and never get any kickback. I have tripped the breaker a few times though. @knotscott By the way, I just read your blog post overview of the tablesaw market. I do a lot of research on the internet on lots of different things, and that has to be one of the best articles I ve ever read on anything. The guy is pure gold to this forum when it comes to advise on consumer grade table saws and table saw blades. Word. Every time I have a table saw issue/inquiry, I rub my miter gauge and say a prayer to knottscott. But seriously, K.S., thank you for your contributions. You’ve pulled a lot of useful information and been generous enough to deposit it in one place (several times) for the ease of the rest of us. Much obliged. My table saw journey began back in 85. I started with a tabletop lowes POS that could not cut a strait line if your life depended on it. Used in my apartment floor on a tarp. I moved up through the obvious under powered tools from craftsman to shop smith. It was not till I bit the bullet and got the 3hp Grizly 1023, did I get any relief. If 220v is the issue just save your pennies a little longer. Its worth it. I used that saw for over 10 years before selling it to move up to a 5hp sawstop. Really I’d stayed with 3hp if I did not want to handle 12/4 and better with greater ease. (only grunt my griz ever gave me). Go on get the 3hp CS they don’t take up any more space and the increased power is worth it. Been there done that got the T-shirt. Good luck on what ever you decide and post pics. We all love new toys, even if not ours. Cheers! In addition to the HP, the larger bed, smoother cuts, less burning, more accurate fence made huge differences in the quality of my work. Just to follow up, I eventually did buy the Grizzly G0690. Very happy with it; a pleasure to use. The fit & finish, packaging, manuals etc etc from Grizzly was very good proving my original concerns to be unfounded. Thanks to all for your suggestions / advice. Awesome setup you got there. Congrats, and thanks for the followup….it’s always nice to know the outcome of one of these threads. My first table saw was a Bosch contractor’s saw, and wouldn’t you know it, the first thing I attempted to put through it was some walnut. So I realized almost immediately I needed a better saw. Like the OP, I upgraded to a 3HP cabinet saw and my god it’s like night and day. I have the PM1000 and often cut 3” of hard maple and 3” of IPE. I do have to slow down the feed rate but I still get a perfect cut. If I did this all the time I would prefer the 3HP. As it is I seldom do it and am very happy with the PM1000. I got it on sale at Woodcraft and it ended up being $1699. I would do it again. I own a 5hp jet. Like MrUnix said; It’s not what you cut its how much of it you cut at one time.